Demonstrating the Complexity of Medical Care - Outsource Management Group, LLC. SCENARIO: So, you are working at a multi-specialty practice that recently employed a urologist. As the Lead Medical Auditor and a member of the Corporate Compliance Team, you begin to worry about the chart audits as you have no members on your team that have worked within this specialty before. Take a deep breath – and remember that the largest volume of claims that the urologist will bill are E&M services. Regardless of the specialty of any medical practice, each will utilize Evaluation and Management (E&M) services in greater volumes than surgical services. Specialty-specific trained medical auditors are well versed in trudging through records to note the disease processes and course of treatments that would be “common place” within the given specialty. However, while having this specialty-specific clinical knowledge is an advantage to auditing the E&M services within a specialty, it is not essential. There are, certainly, specialty-specific considerations that may vary; however, the guidelines relevant to E&M documentation remain very consistent with no exceptions or modifications based on specialty. As we discussed earlier, there are some differences within specialty disease processes and treatment plans that will vary along with the specialty-specific exams of the 1997 Guidelines, but otherwise, the rules and guidelines remain the same. Medicare is very specific in their requirements that a provider “paint a portrait” of the patient to show the patient’s clinical complexities to support the medical necessity of the encounter, which also, per Medicare, is the overarching determining factor in E&M code selection. Therefore, any type of analysis about the patient’s condition impacting the care of the patient’s condition should be documented by the provider as opposed to merely implying the severity and medical complexity. When evaluating a medical record for the medical necessity and appropriateness of the service(s) billed, the record should be reviewed based on the actual analysis of the patient’s condition as demonstrated by the physician documentation with no additional interpretation needed by the reader of the documentation. Evaluation of the medical necessity occurs in the same manner as auditing the documentation components, by starting at the beginning. The historical information of the patient is documented most commonly at the introduction of the encounter. Within the historical information we should find the chief complaint of the patient, the history of present illness (HPI), the review of systems (ROS), and the past/family/social history (PFSH). These elements within the history component should work together to demonstrate the severity of the patient condition according to the patient. Documentation that demonstrates this severity in the most appropriate and consistent manner will be constructed in the style of a pyramid, starting at the top point with the chief complaint and expanding into the patient’s condition. The exam portion of the documentation should accurately reflect the objective portion of the encounter that was performed to access the patient in search of validation of the patient’s complained severity. The exam and the assessment of any lab/testing results should be documented to show the interpretation of the provider based on the stated severity according to the patient. Essentially the exam and assessment will document the thought processes and the contemplation of the patient’s complaints and noted nature of the current condition and then a comparative analysis to the providers own accounting of the patient. The plan of care is oftentimes not as well orchestrated as it could be to best represent the severity of the patient per the provider’s interpretation. 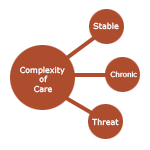 The plan of care should connect the dots between the patient’s current problem and how the current problem is or is not being affected in an exacerbating or complicating manner. The medical necessity will walk up a scale of severity. If an auditor cannot determine through the actual documentation that exacerbation or a complication exist, then higher levels of service, according to the documented medical necessity could not be supported. Such supporting documentation is represented through those required by documentation guidelines within the medical decision making. This makes it very relevant and real as to why the provider should document the amount and complexity of the data reviewed, the diagnoses that affected or were affected by the patient’s condition today, and the risk associated with caring for this patient. Missing these elements could lead to not fully demonstrating the severity of the patient. Auditors who do have experience in a specialty are able to note these differences with the slightest implied association due to their clinical knowledge. Although it should be required that auditing standards dictate that an auditor must have some expertise in the specialty in which they audit, at this time this is not the case at the claim level, within the OIG, DOJ, CMS, or any other carrier or auditing entity. For this reason, a physician-advocate auditor should work with their provider on a consistent basis to ensure that the information needed to support complexity is not merely implied and awaiting interpretation, but that it clearly stated and easily identified.